We’ve written a good deal on our own issues of poor health that have been largely rectified by drastically changing diet and lifestyle and adding certain supplements into the mix on a daily basis. This has allowed us to lose 75 pounds and eliminate the need for certain medications. Beyond this, a sleep apnea machine is no longer used to sleep at night. It continues to amaze how things change when diet and supplementation is taken seriously. We recently came across another book written by Carolyn Dean, who happens to be a medical doctor and a naturopath. Her book, The Miracle of Magnesium is profound in many ways. The book covers quite a bit of ground, from the history of magnesium to magnesium-deficient conditions, to more research on the subject, to finally testing and supplementation itself. I thought I knew enough about magnesium, but after reading this book, it’s clear I knew very little about it. In fact, I wasn’t really taking any of it. I was for a while though and then when I went to refill my pill cases where I store my supplements for daily ingestion, for some reason I neglected to add magnesium back into the mix. It was pretty interesting to me that my blood pressure had been actually below normal for some time, but on the day I went to my heart doctor for my six-month check up, it was higher – in the 140 range for the top number. I didn’t know why. Because I kept a careful record of my blood pressure readings and showed him, the doctor wasn’t concerned either since many people have elevated blood pressure when they see a doctor. They chalked it up to that. However, over the next few days, I saw an increase in my blood pressure, which started to alarm me. Yep, I racked my brain and brought it to the Lord in prayer. What was the problem?! Eventually, as though the light turned on, I realized that I had not been taking the magnesium supplement that I had previously taken. Turns out I was only taken 100 mg supplement in the evening, but apparently, it was enough to help keep my blood pressure lower. I began doing some research into magnesium and understood that there is a growing body of evidence that suggests that the properties of magnesium can and will lower blood pressure by relaxing the muscles surrounding the heart. It can also impact the blood vessels themselves. The more I researched, the more I understood that magnesium was a supplement that I really needed, yet it isn’t discussed that often. Calcium is highlighted a great deal so most people, when taking supplements, will naturally gravitate toward calcium because it is far more well-known. Dean’s book gives us the real story about magnesium. She provides thorough explanations for why magnesium works so well and exactly how it works. After reading her book, I can certainly agree that magnesium lives up to the title of her book. Things I’ve stated before are also brought out in Dr. Dean’s book. Factory-farmed food that ends up in what is known as highly processed food (stuffs), is almost always seriously lacking in basic nutrients, including magnesium. Manufacturers try to compensate for this by adding supplements and minerals to the food they produce (they call it “enriched”), but it’s not the same thing as the food itself having those minerals in them from the beginning. A large part of the problem is that most of the food grown today is done using fields that are never given a rest. Plant, harvest, plant, harvest until the soil is thoroughly depleted. Even when additives are put back into the soil, the pesticides and heavy-duty farming can and does deplete that soil. If the necessary minerals are not in the soil, the plants cannot obtain them because the plants generally do not create their own magnesium. They either have it as part of the DNA or do not. Healthy soil, with the proper magnesium already in it benefits all plants. So Dr. Dean recommends first and foremost, organically farmed plants. She’s not a vegan and does not recommend it because people who are vegans often lack basic minerals like magnesium as well. Her emphasis is on quality food, which of course, means avoiding all the harmful stuff that’s out there – things containing high fructose corn syrup, gluten, wheat (if possible), and a host of other things that do not add a thing to our systems, but ultimately wind up tearing things down. That’s quite a list and that’s not even complete! Dean speaks to the facts of what magnesium does in our bodies and in many ways, it is indeed a miracle supplement. In fact, as Dean points out, without magnesium there is no life! Magnesium not only sustains life but can improve numerous ailments that are actually caused by a magnesium deficiency. Have you taken the time to notice that way too many people in the United States simply look extremely unhealthy? They are overweight, have difficulty breathing, they have no staying power, and watching them trudge from their car to the store is agonizing at times. Your heart goes out to these people. What are they doing wrong? Most of them are simply eating incorrectly and even though they are overweight, they are often starving themselves to death because they lack good nutrition. They eat all the processed foods for all meals, even if they eat at a restaurant and while they may feel “full” when they’re done, their bodies are not satisfied because they have failed to eat the things that their bodies actually need. So, the body sends out “cravings” in an attempt to force the person to eat more things. Often, the things they reach for are filled with lots of carbs and are labeled “low-fat” so the person believes that they are at least trying to eat in a healthy way. This unending vicious cycle brings a person’s body to the point where it cannot fight off health issues. Parts of their body begin to shut down and act out. The person then goes to the doctor and the doctor will prescribe something for their symptoms. Remember, doctors are not trained to find cures. They are trained to treat symptoms. Treating the symptom simply makes the person believe they are healing or improving when in reality they are not. That person will continue eating the same way, but now that the symptoms are masked, they appear to be on the mend. I cannot stress this enough because I am living proof of it. Most of our health problems start based on what we eat and drink and what we do not add to our diet. For years, I thought I ate a healthy diet – pizza (“good” pizza, not cheap stuff), tacos, steak, hamburgers, etc. Every once in a while, I’d have dessert although there were times when I’d gobble up a dozen Oreo cookies before dinner then have dessert after dinner as well. That all changed nearly six years ago when I realized the truth. I was slowly dying. I was on my way to congestive heart failure, my blood pressure was very high, I had to have parathyroid surgery, both rotator cuffs in my shoulders needed surgery, my back was always giving me problems and among other things, I lacked energy and could not think straight. It was not a happy time at all. There were times I wondered why I was still living, frankly. It’s not that I wanted to die either. It’s that I thought I was on my way out because I couldn’t see how my health improving with age. In order for my health to improve, I finally realized I had to make the changes. Six years later, I have made great inroads and apparently, there are still things that the Lord wants me to change. I cannot say that adding magnesium into my daily regime will be the last change either. There may be other things that I need to adopt as a regular practice and I’m willing to do that. The last thing I want to be is decrepit in my 60’s, sitting in a wheel chair in my 70’s, or laying in a bed in my 80’s if I live that long. God has my days numbered and that cannot be changed. The quality with which I live those days is largely up to me and I know that the Lord is my Helper. Did you know that magnesium is one of the best analgesics known to humanity? People will pop aspirin, Tylenol, or Aleve without thinking about it, but they actually have to be directed to magnesium. Why? Because we all know there is no money in pushing magnesium supplements. Pharmaceutical companies make money on their products and magnesium, like niacin, appears naturally in nature. It cannot be patented so the pharmaceutical companies are not going to push these things, because they spend millions each year on the development of drugs for specific symptoms. Wouldn’t it be weird if God actually made us to benefit from supplements that He also created in nature? Yes, that’s a bit tongue in cheek because I believe He has done exactly that. Long time readers understand that I am not opposed to traditional medicine. In fact, when people are in dangerous or critical conditions, it is the medical profession that works the best and more quickly than homeopathy or naturopath. However, once the medical profession is able to get the patient away from being critical, homeopathy and naturopath can truly help if guided by a qualified naturopath. Again though, if people ate better quality food, they would not be experiencing the type of problems that too many experience today including obesity. My wife and I live out in the country on several acres. We moved here last year. Just this spring we decided to take a 30 foot by 30 foot section of lawn and turn it into a garden. A friend from church was kind enough to bring out his tractor and disc to turn over the ground the first time, breaking up the lawn. We then used our little roto-tiller to do the rest. I built a fence all the way around it with chicken fence and a gate. I then draped a netting over the entire top of it and the sides to keep it secure from rabbits, deer and other creates who would look longingly at our produce and think we were growing it for them. We determined ahead of time that this was an experiment. We weren’t sure what the results were this first time, but we would learn from this first attempt. However, we were surprised with the numbers of tomatoes, cucumbers, watermelons, cantaloupes, and other things that sprang up and all of it was fully organic starting with the seeds/small plants themselves. If I could stress one thing to anyone who reads this it is this: garbage in; garbage out. What you eat or drink will affect your health and it is likely you are not getting enough vitamins and minerals even if you eat healthy. Please, for the sake of your body and mind, research things. Find out what benefits you and what destroys you. For some of you it might be a long road back to health like it was for me. The results are worth it though. Entry filed under: Agenda 21, Religious - Christian - Prophecy. Tags: blood pressure, carolyn dean md nd, eating healthy food, health, miracle of magnesium, supplements. As a lifelong industrial chemist, now retired, I am familiar with good nutrition including the need to supplement the essential mineral, magnesium, daily required at about 400 mg as elemental Mg. Dr Dean is right: most of us are Mg deficient causing the wide range of health problems in her list. 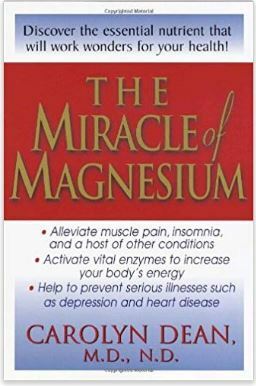 I did not read her book but from the label description of her supplement it is an oral version of Magnesium oil, actually Mg chloride, normally used topically to improve joint function. In contrast, most of us are calcium overloaded if eating dairy products and especially if using Ca supplements that are totally unneeded and cause harmful calcification of our organs like heart, kidneys, arteries, joints, etc. We need only about 500 mg Ca daily which is easily gotten from dairy products. Taking Mg will gradually remove some of the calcium deposits, especially in arthritic joints. Similarly, inflammatory iron overload, measured as blood ferritin levels over 100 ng/ ml, from eating red meat is another cause of the same diseases of aging. Best fix is avoiding at least red meat or better yet going vegan. Thank you for your thoughts. Dr Dean also says we have too much calcium in our system which causes a plethora of problems. She goes into some detail about maintaining the correct balance between magnesium and calcium. Amazing what many don’t know and how that lack of info can harm us.